One of the things we keep talking about on our blog is immersing yourself in the language if you want to learn Irish Gaelic. You may think that’s complicated but if you watch our Bitesize Beo video below, you’ll realise it’s actually quite easy to accomplish. A great way to immerse yourself in the language is to use active and passive listening to learn Irish Gaelic. A few weeks ago we created a live video event for Irish Gaelic learners – Bitesize Beo and it was a success. A lot of people joined our webinar and got one step closer to learning Irish Gaelic. We had an amazing audience and the speakers did their utmost to explain and interact with people who had questions. Overall it was a great experience for both us and you – amazing people who want to learn Irish Gaelic. We’re going to have similar events in the future so don’t forget to subscribe to our newsletter since that’s where we usually announce them. 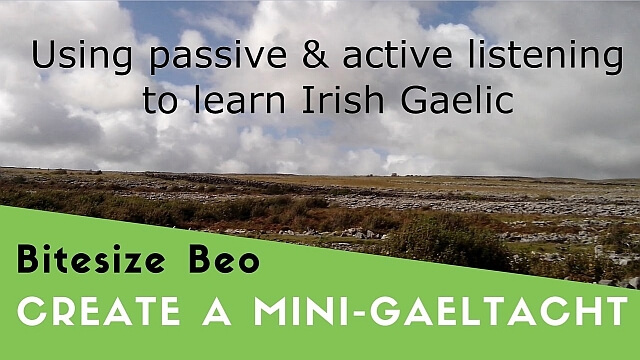 The next Bitesize Beo video will help you understand how to use passive and active listening to learn Irish Gaelic. You’ll be watching Audrey and Eoin talking about these techniques and get a better insight on how this can help you learn Irish Gaelic. Keep an eye open for this type of content since we’ll be providing you with an easy way to access it – you’ll be able to see the full Bitesize Beo videos and download the speaker’s notes. Check out the original Bitesize Beo blog post to learn more about the speakers and what you’ll be able to see in the next weeks. Urban Irish: Blight or Blessing?